(1962) "I Love You the Way You Are"
"Roses Are Red (My Love)" is a popular song composed by Al Byron and Paul Evans. It was recorded by Bobby Vinton and was his first hit. The song was released in April 1962. It reached No. 1 in Australia, New Zealand, Norway, South Africa, and the United States, and was a major hit in many other countries as well. The song topped the Billboard Hot 100 singles chart on July 14, 1962, and remained there for four weeks. The single was also the first number-one hit for Epic Records. Billboard ranked the record No. 4 in their year end ranking "Top 100 Singles of 1962" and No. 36 in their year end ranking of the top Rhythm and Blues records of 1962. The song was also ranked No. 17 on Cash Box's "Top 100 Chart Hits of 1962". In the UK, a cover version by Northern Irish singer Ronnie Carroll reached No. 3 on the Record Retailer chart on August 8, 1962, the same week that the Bobby Vinton record peaked at No. 15. It peaked at No. 7 in the very first Irish Singles Chart published in September 1962. The song was recorded by Jim Reeves in 1963 and released on the album Gentleman Jim, one of the last albums released while he was still alive. The song was covered by Singaporean female artist Zhuang Xue Fang (莊雪芳), in edited Standard Chinese lyrics written by Suyin (舒雲/雨牛) under title name of 玫瑰花香, with Ruby Records in 1967. In 1962, an answer song, entitled "Long as the Rose Is Red", was recorded by Florraine Darlin. The song spent seven weeks on the Billboard Hot 100, reaching No. 62, while reaching No. 15 on Billboard's Easy Listening chart. It was released by Epic Records (single #9529) and was also produced by Robert Morgan. ^ a b c Hot 100 - Bobby Vinton Roses Are Red Chart History, Billboard.com. Retrieved March 19, 2018. ^ a b c Bronson, Fred (2003). The Billboard Book of Number One Hits. New York: Billboard Books. p. 113. ^ a b "Top 100 Singles of 1962", Billboard, Section II, December 29, 1962. p. 82. Retrieved February 24, 2018. ^ a b "The Top 50 Country Music and Rhythm & Blues Records of 1962", Billboard, Section II, December 29, 1962. p. 88. Retrieved March 19, 2018. ^ a b "Top 100 Chart Hits of 1962" (PDF). Cash Box. December 29, 1962. p. 10. Retrieved March 20, 2018. ^ "CHUM Hit Parade – Week of July 02, 1962". CHUM. Archived from the original on November 7, 2006. Retrieved 2015-12-17. CS1 maint: BOT: original-url status unknown (link) Chart No. 275. ^ Bobby Vinton - Roses Are Red (My Love), Ultratop. Retrieved June 3, 2018. 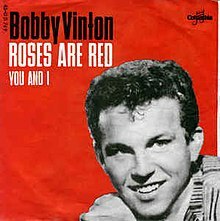 ^ a b Bobby Vinton - Roses Are Red (My Love), norwegiancharts.com. Retrieved June 3, 2018. ^ Hot R&B/Hip-Hop Songs - Bobby Vinton Roses Are Red Chart History, Billboard.com. Retrieved March 20, 2018. ^ "Hot R&B Sides", Billboard, August 4, 1962. p. 34. Retrieved March 20, 2018. ^ "Top 20 Hit Singles of 1962". Retrieved 26 December 2018. ^ "Top Adult Contemporary Songs of 1962", MusicVF.com. Retrieved March 16, 2019. ^ "The Irish Charts – Search Results – Ronnie Carroll". Irish Singles Chart. Retrieved March 19, 2018. ^ "Gentleman Jim - Jim Reeves". AllMusic. Retrieved March 20, 2018. ^ Hot 100 - Florraine Darlin Long as the Rose Is Red Chart History, Billboard.com. Retrieved March 20, 2018. ^ Adult Contemporary - Florraine Darlin Long as the Rose Is Red Chart History, Billboard.com. Retrieved March 20, 2018. ^ "Late Pop Spotlights", Billboard, August 4, 1962. p. 10. Retrieved March 20, 2018.